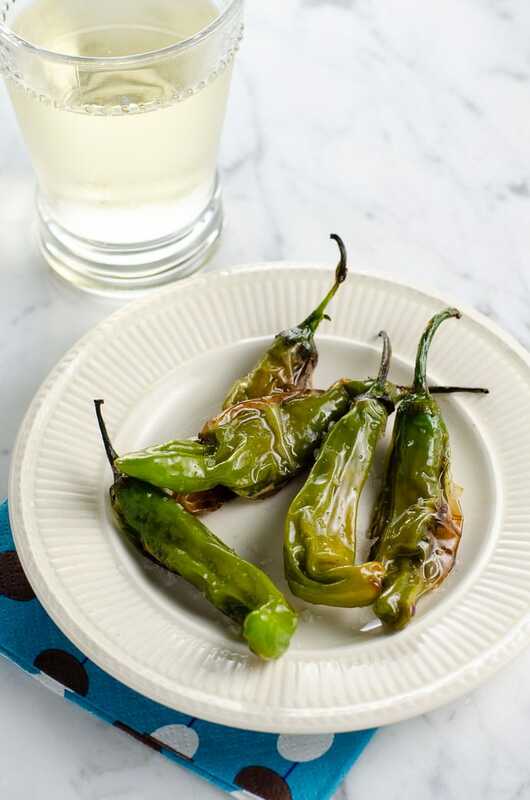 This quick and incredibly easy shishito peppers recipe is great to nibble on with drinks. Padrón peppers work perfectly too. 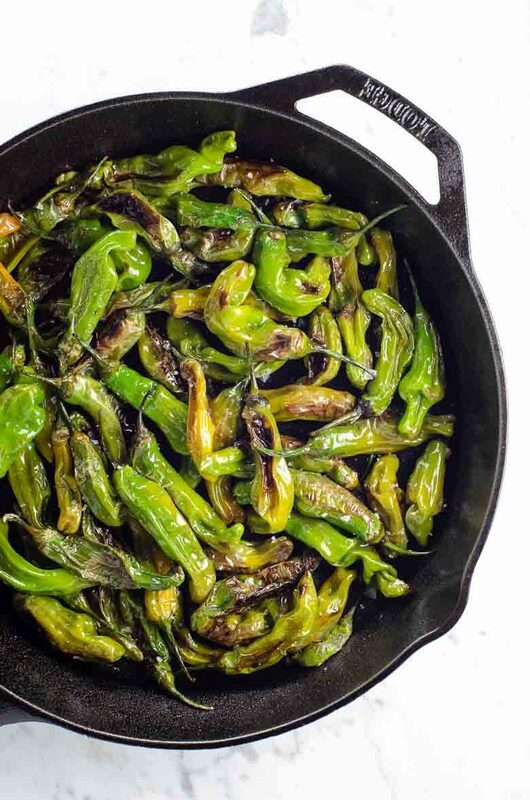 Part of the fun of this appetizer is that shishito and Padrón peppers, while mostly quite mild, are intermittently spicy. They come with a built-in game of roulette. People always talk about how working for yourself results in both more work and more flexibility. Today I’m here to testify to both of those points at once by publishing four recipes. I feel good about the work part of this equation, but you could argue that four posts in one day is kind of an abuse of discretion on the flexibility front. Guess what? I’m good with it, and my boss is, too. That’s right — ain’t no one here to nix my bad ideas. That said, here’s hoping you still trust me to know a good idea when I see one, because this shishito peppers recipe is one of the best ideas the world has ever had. It’s so good, in fact, that it’s been had equally in Japan and in Spain, where the very similar Padrón peppers stand in for shishitos. Psst…speaking of good ideas: try these guys dipped in spicy mayo. If you’ve ever had shishitos at your favorite sushi restaurant or Padróns at tapas, you know how weirdly addicting these little peppers can be. (And if you haven’t tried them yet, you’re in for a treat.) They’re perfect for sharing. They complement a wide variety of beers, wines, sakes, and cocktails. They’re really pretty good for ya as bar snacks go. And they’re TRULY quick and easy to make. I mean, you kinda burn them on purpose. It doesn’t get easier than that. Shishitos and Padróns are cousins who grew up in different parts of the world. Shishitos are from Japan, where apparently they were named because their ends look like lion heads, though I can’t say I quite see it. Padróns are from their namesake region of Spain and are generally a little fatter than shishitos. These peppers are just the right size for a bite or two, and you can eat the whole thing except the stem, which serves as a perfect little handle. They’re generally pretty mild, though part of the fun of eating them is that you’ll occasionally get a pretty spicy one and need to take an extra swig of your drink. People claim that Padróns are more likely to be spicy, but I can’t really confirm this based on my own experience. The shishitos I cooked up for these photos were consistently on the pleasantly warm side, and I suspect there are enough varieties of each kind of pepper on the market these days that it’s all a bit of a delicious gamble. These bite-sized, slightly spicy peppers make a beautiful bar snack. Protip: try them with spicy mayo. In a 12-inch cast iron skillet, warm the oil over medium heat until shimmering. 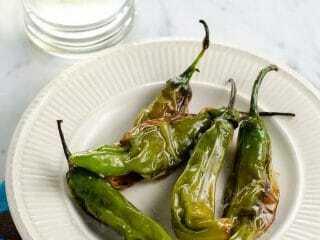 Add peppers and cook, tossing frequently with tongs, until soft and blistered in many spots, about 10 minutes. Sprinkle with lots of flaky sea salt and serve (with spicy mayo if you like).